← Miami Florida Kosher Wine Tasting of Israeli wines in May – do not miss it! This weekend we enjoyed another simple meal of alcohol and brown sugar braised ribs cooked in a crockpot overnight. The ribs were lovely and only needed for the fat to be removed from the braising liquid – and magically we have a dinner. The dish was paired with some brown and black rice and a fresh green salad. 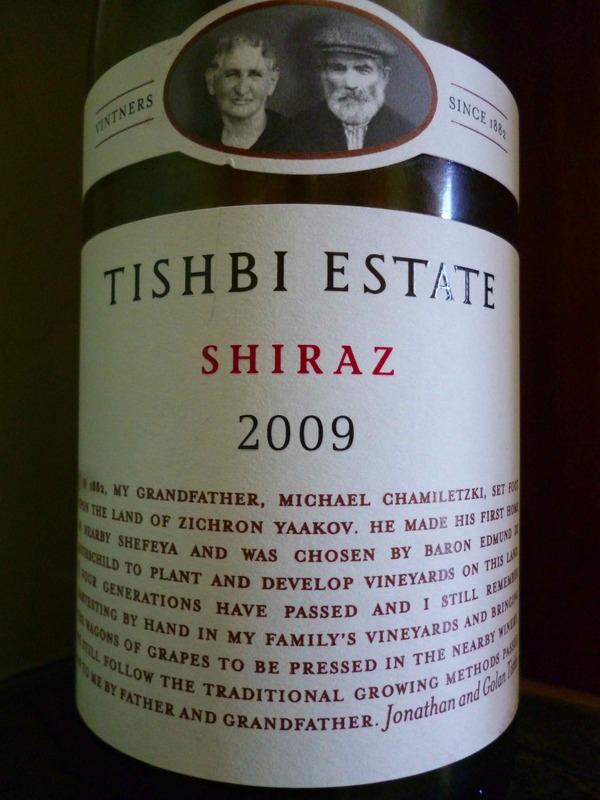 I recently wrote about the Tishbi Winery and when I was there in December last year, I enjoyed the 2009 Tishbi Syrah. So, when the opportunity to try it again came my way – I was more than happy to buy some. I bought the Tishbi and Gush Etzion wines from a local distributor, Harken Spirits here is the South Bay run by James Jimenez, an ex-software guy turned wine runner! Harken is selling some very good wines, like Tishbi and Gush Etzion wines. Both of which I have written about many times. I cannot say I like any of the Kadesh Barnea wines, but to be fair there are many who like the wines – and are good examples of starter wines; wines that are sweet and ripe and not overly complex; AKA gateway wines. The other bottle I had was the 2011 Hagafen Sauvignon Blanc. I really like Hagafen wines, the whites especially and some of the reds. I last wrote about Hagafen in 2010, and I really need to update the notes – look for that soon. The wine is round and ready and one that pairs extremely well with dishes needing spice and ripe fruit, such as stews, ribs, and cheeses. The nose starts off with ripe blueberry, plum, currant, and cherry, with hints of rich dirt and licorice. The mouth is nice round and spicy, with good concentrated fruit, but lacking in deep complexity. The mouth is sweet with lots of date, sweet blue and red fruit, with hints of blackcurrant in the background, but with ripe sweet and deep strawberry flavors coming out over time, with candied raspberry, sweet cedar, and good integrated tannin adding to the mouth. The finish is long and spicy with Garrigue, bramble, light leather, animal notes, and chocolate. Drink in the next two years. The nose is rich with fresh cut grass, ripe peach, apricot, guava, and melon. The mouth is ripe and fresh, with great acid, only a hint of residual sugar, crazy ripe and fresh mouth with nice grass, awesome lemon fresche, more bright fruit, pineapple and ripe pink grapefruit. The finish is long and ripe with green notes a bit of pith and a hint of blood orange. This is a lovely wine but lacking complexity to take it to the next level. Posted on April 28, 2013, in Food and drink, Israel, Israeli Wine, Kosher Red Wine, Kosher White Wine, Kosher Wine, Wine, Wine Tasting and tagged Hagafen Winery, Sauvignon Blanc, Syrah, Tishbi Estate, Tishbi Winery. Bookmark the permalink. 1 Comment.